Reader comments can be switched on and off for a whole publication, for a particular Article Type, or for each individual article. You can take advantage of Newscoop's management features to moderate comments from logged-in readers and members of the general public too. To set the default comment setting at the publication level, go to Content on the main navigation menu, and then click Publications. In the Comments status column on the List of publications page, publications in which readers can post comments are shown with a check mark. 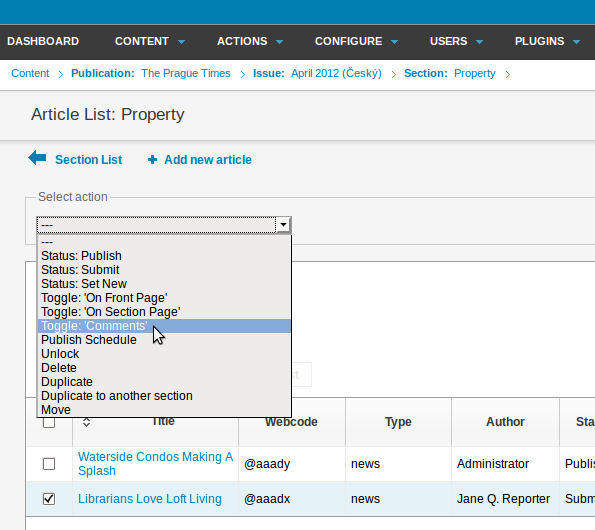 Click on the Configure pencil icon for the publication you wish to enable or disable comments for. This action opens the Edit publication page. In the Comments Settings, there is a checkbox labeled Comments enabled? and a variety of options which enable you to fine-tune comment settings. Perhaps you want to enable comments for all articles of a particular type, for example news, but not enable them for another type, such as page. 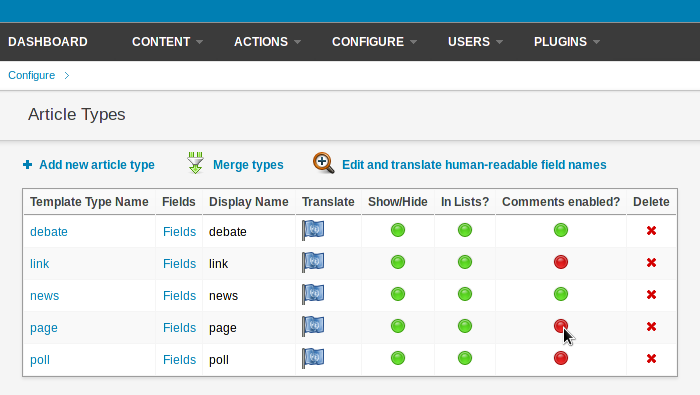 Click Configure in the main navigation menu, and then click Article Types from the submenu. On the Article Types page which appears, clicking the red or green light icon in the Comments enabled? column toggles the setting for each article type. After you click on a green light icon, you will be asked if you are sure you want to deactivate comments for that article type. Comments can be enabled or disabled for a number of individual articles at once, using the Article List page. Click Content on the main navigation menu, then use the sub-menus to navigate to the publication, issue and section that you require. 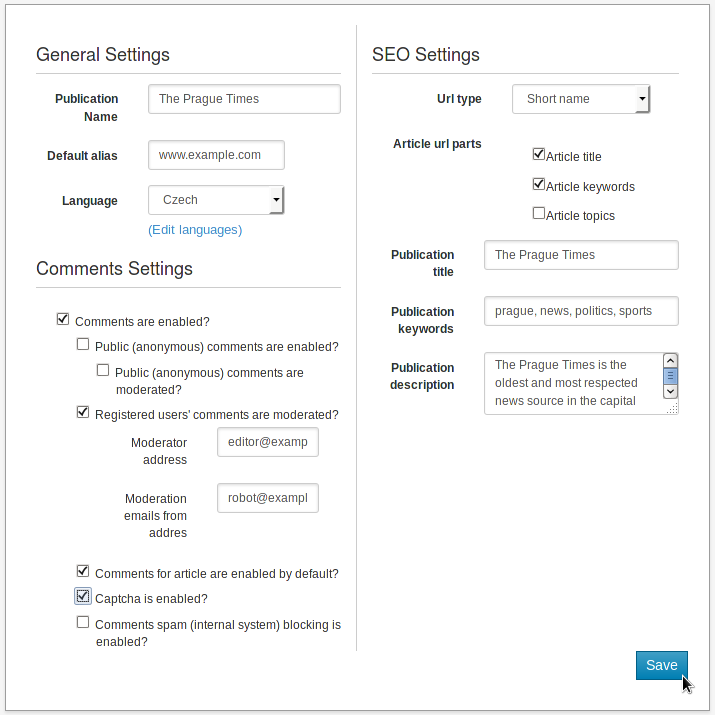 In the Article List page that appears, use the checkboxes in the left side column to select the articles you want to enable or disable comments for. Then use the drop-down Actions menu and click on Toggle: 'Comments'. If the publication or Article Type that the articles belong to have comments disabled, then enabling comments for those individual articles will have no effect.